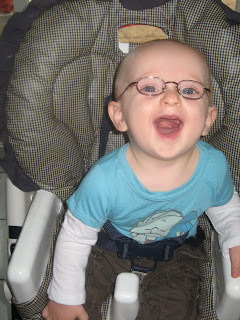 Happy First Birthday, Linus Victory!! It's my birthday, y'all! Can you see who's on my shirt? Awkward picture of the boy, but can you see the shirt better? While Linus was not named after the Peanuts character, it's hard not to make the comparison since it's our culture's most well-known Linus and we live next door to a Lucy that is not quite a year older. 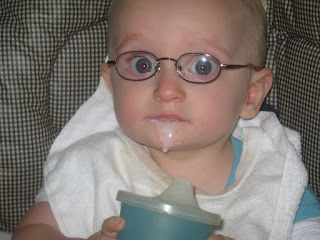 To celebrate the occasion, Linus got to drink cow's milk for the first time. As you can see, he's not quite sure what to think of it. He also got some oatmeal pancakes. His sisters enjoyed them as well. This is the back of the Linus shirt. So true. Check back for the rest of the day's festivities, the gifts, and the knock-down, drag-out, biggest dang first birthday party this family has ever seen. I can't believe my baby is one! No, not Linus', but Amelie's!! 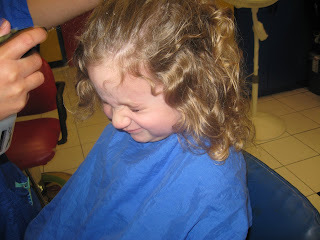 I've been a parent for just over 4.5 years and I've never gotten a hair cut for any of my children. 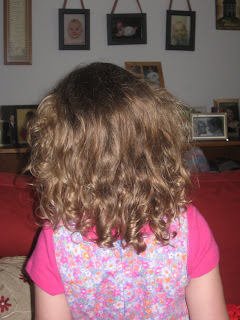 Amelie didn't have much hair to speak of until she was two. 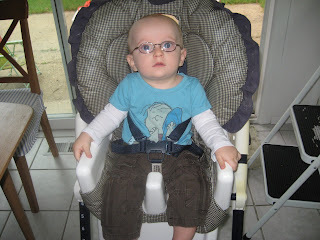 Here's a picture of her on the day we brought Violet home from the hospital. Amelie is just two weeks shy of her second birthday in this shot. Not much hair, eh? 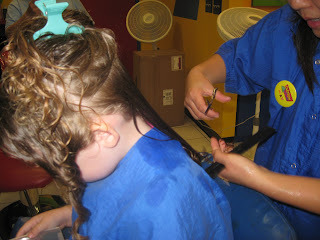 When her hair did finally start to come in, even though it was rather uneven, I couldn't fathom cutting it off! We had waited so long for it! We'd endured the "How old is he?" 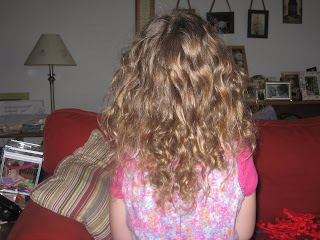 question a few too many times to cut off the primary evidence of her girlness! So another two and a half years later, today, the day, came. She was ready. I was ready. So we went ahead with it. And after. Not a huge difference. We just evened it up and cut off all of the straggles. Being wet down. I love her face in this one. 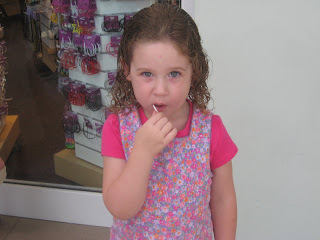 The lollipop and Claire's Boutique behind her. We spent more on new hair accessories than the haircut itself, I think. Here's to no more split ends! Who would be willing to watch any or all of my children at the drop of a hat? Who does my dishes and folds my laundry when at my house? Who will change her plans for me? Who puts her family above any other responsibility? 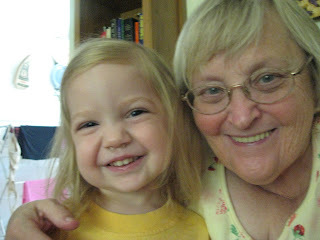 Who loves every single one of her grandchildren, a dozen of them, like they are her only one? Who loves all four of her children, as if each were the planned one*? Who loves all four of her children-in-law as if they were her own? Who would give you the very shoes off of her feet (or toaster oven in her trunk or tv in her shed**)if that's what you need? Who would save articles from the newspaper for you or tell you about applicable bits she saw on tv, making it apparent that she always has you on her mind? Who would pack your open wound for weeks following a c-section***? Who would invite you (and your husband) to live with her, collect a meager rent check from you each month, and then give it all back to you in a housewarming card with the words "you rented to own" written on it? About whom is it that I could keep going on and on? My sweet Mom. That's who. She's an amazing example to me and to so many others of selflessness, devotion, and kindness. **My mom is a bit of a pack rat. She'll admit it pretty readily. 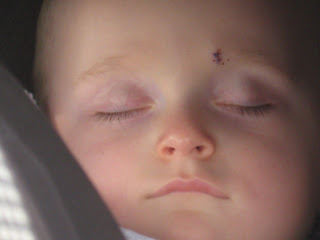 ***About two weeks after Amelie was born, my c-section incision opened up. My mom went to the doctor with me, learned how to care for it, and came to my house twice a day for weeks, to be my personal nurse. Last weekend, we ventured up to Lititz, PA to visit some friends of Duncan from high school. Six adults and eight children were in a home normally occupied by two adults and 1.5 children. It was an adventure and it was a great time of catching up and meeting some of the children for the first time. On Saturday afternoon, the majority of us ventured off to the park where it was discovered that Linus LOOOOOOVES swinging. Don't believe me? Then check it out for yourself. 3. In A Week, My Baby Will Be One! I know blogging has been neglected, but I'm feeling like my priorities are getting back in line. For that, I am very grateful. 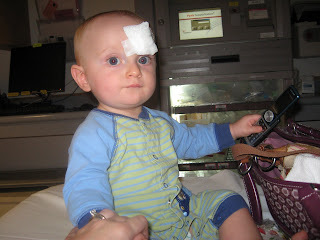 For Linus, visiting Hershey, PA meant two stitches in his left eye brow. Stupid coffee table with the sharp-edged legs. What were those hotel people thinking? 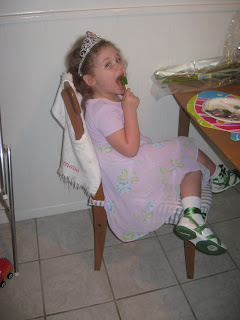 Shoes: a find at a consignment store--green ballerina Nike's. What's up with that? I couldn't pass up these never-worn-before shoes that were only $5! Little Girl: The reason that the last four and a half years have been the best of my life! I just couldn't resist sharing this series of shots of Violet. 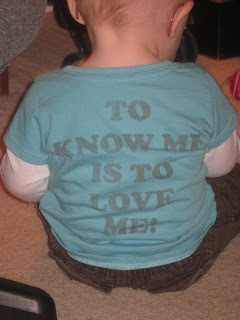 I love this outfit--such a cool kid! 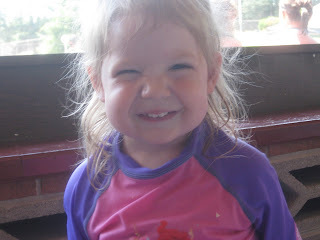 In this one, she's gearing up for one of her trademark sunshiney smiles. And here, she's between smiles. This is what my sweet girl looks like naturally. 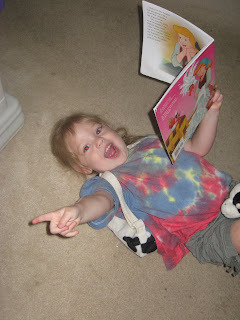 And here, she's shouting, "Take a picture of Violet, Mommy!" Linus eventually became mostly ok with his "breathment retreats" as they are now called. 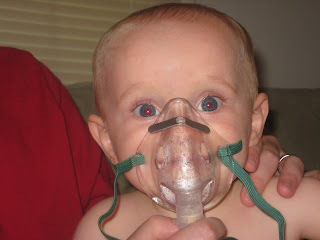 Once he learned how he sounded while talking with the mask on his face, he was all set. Licking the mask is pretty fun too, you know. August 6, 2007. A day forever etched in my memory. I have been dreading this anniversary. Isn't that strange? It was the first day of the hardest month of my life, but it all turned out well in the end. It has a happy ending, right? So why have I been dreading it? I'm really not sure. I did come to a conclusion, however, over the last week or so as I pondered it's arrival. I wanted to do something to commemorate this occasion. Something that would make a difference in my life and the life of my family. So my plan is two-fold. 1. For the next 23 days (the amount of time I was in the hospital before Linus was born) I will be participating in an internet and e-mail fast during daylight hours. This means that I will not check my e-mail, my blog, my Facebook, other people's blogs, play Scramble, read Google news, etc. etc. etc. while the sun is out. You see, while the sun is out, my children are awake. And I don't want to associate with the computer (unless to listen to music or a sermon) while my children are awake. It's been sucking up way too much of my time and it needs to stop! 2. For the next 23 days (at the very least), I will strive to be more intentional about the time I spend with my children. I will strive to turn the t.v. on less. (It's only on an hour a day usually. But I'd like to leave it off most days if possible.) I will strive to read more, play more, do more, teach more, love on more, and just be more--physically and mentally--with my children over these next 23 days. After all, last August, what was my number one complaint? I want to work on NOT taking them for granted. 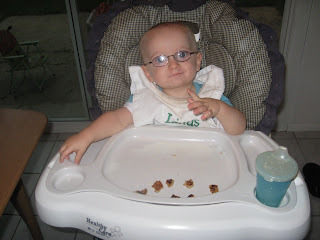 I want to work on appreciating them--their developmental milestones, their conversation skills, their senses of humor. My hope and prayer to is become more focused on what really matters in life. Please pray for me, especially for self control, as I take on this challenge. This past week, we visited a new (to us) toy store in Annapolis. We had been there once before, a few weeks ago. The store is amazing--so many fun things to look at and play with. It's so enchanting that I even want to bring everything home! While in this store (we've been there twice) the girls did an incredible job of looking and playing and enjoying. And, at the same time, they did not whine or demand a single thing! The first time we visited the store, Duncan was with us. We marveled together at how nice our visit was and how we would definitely return again, based on how well the girls behaved. The most recent time, my mom was with us, and we observed, once again, how pleasant it was to be in the store with Amelie and Violet. At that point, I decided I wanted to reward them in some way. But how? I didn't want to buy them a toy. That would set a precedent of good behavior equals toy. Not good. I didn't want to buy them food. I have issues with food and don't mind rewarding with a treat sometimes, buy I don't want every reward to be edible for my children. Then it occurred to me. Our next stop was Whole Foods. And Whole Foods has the most gorgeous selection of flowers. I'd let them each pick out a bunch (within reason) that we could bring home, look at, and remember why we have them. Perfect. 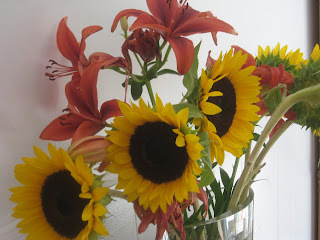 Amelie chose the sunflowers. The are locally grown and were only 6.99 for the bunch of seven flowers. Violet chose the gorgeous orange lilies that were a little more than four dollars for the bunch. So eleven dollars later, we have a more-short-term-than-a-toy but more-long-term-that-a-cookie reward for exemplary behavior in the toy store. 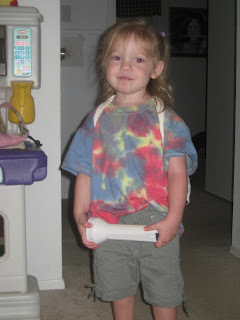 I'm wondering--what alternative methods do you have for rewarding your children? Is there something that you've done or are doing that really seems to work? I'd love to know. So share away! Sweet Violet, a real charmer, is so sunshiney and cheerful and happy. "I'm the mommy and you're the fweetheart." Her smile is endearing. Her laugh is infectious. She's so full of sweetness. I'm not sure what we'd do with out her tender heart! Amelie has gotten very interested in picking out everyone's clothes each morning--even mine! 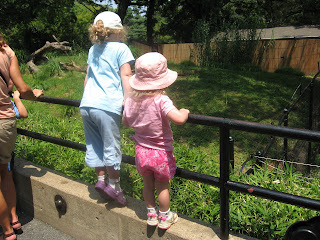 This past Saturday when we went to the zoo, (Yes, Heather, it was the National Zoo. Is there any other =)?) Amelie was very excited to have picked out her all-blue outfit. So going along with the monochromatic theme, she chose an all-pink outfit for Violet. She's working hard at the matching thing and I think it's adorable. A few weeks ago, Linus needed a new outfit in the middle of the day. I asked Amelie to choose one and bring it to me. She was so excited to discover an orange and blue plaid shirt that matched PERFECTLY with an orange and blue plaid pair of shorts that Linus has. As you can imagine (which you'll have to do since I failed to photograph the occasion), they were two different plaids that were mostly blue and orange. I thought her logic was perfect and dressed Linus in an outfit that clashed horribly because his well-meaning older sister was so excited about the discovery she had made. 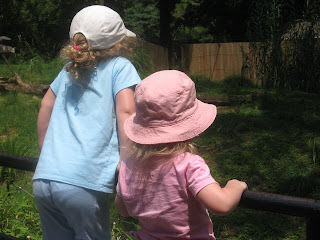 As much as I like to have the girls match and to have them look "just so," I must admit that I adore seeing children, out in public, that most definitely dressed themselves. 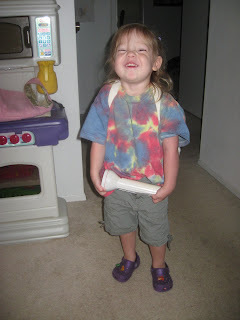 I'm often happy to have my girls dressed in the clothes of their choosing. Amelie does know, however, that there are some days and occasions that Mommy chooses what will be worn and that's just it. Although, I'm learning that the more and more freedom I give her, the better she does. She seeks guidance and asks questions about appropriateness, for which I am thankful. I hope that she always feels free to ask such questions, about all manner of topics. And I hope and pray that I'm a mother that's able to foster this aspect of our relationship over the years. Hope you have a fabulous weekend, whether your clothes match or not.